Fight against the incoming alien menace! You have been chosen. Are you ready to fight? 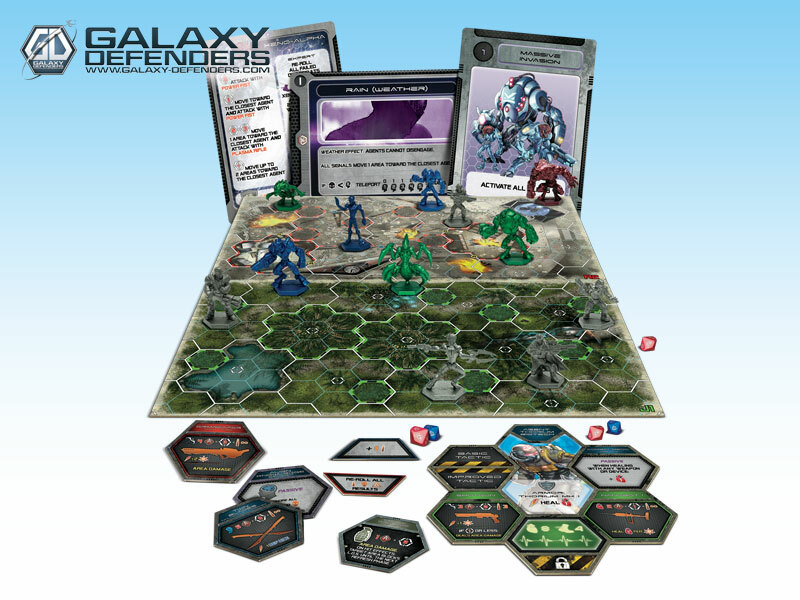 In Galaxy Defenders, each player takes control of one or more agents with unique powers, trying to defend the planet from an alien invasion. The battle for Earth against the aliens develops in a series of missions organized in a story-driven campaign. Missions are based on modular maps designed by "0onegame" and are played over a variable number of rounds. Each mission may have multiple endings and the outcome of any mission will change the flow of the story. The battle will be carried on round after round; each player will play in sequence his agent turn and then, one aliens turn. after that, the game will pass to the event phase that will bring the players to the next round. 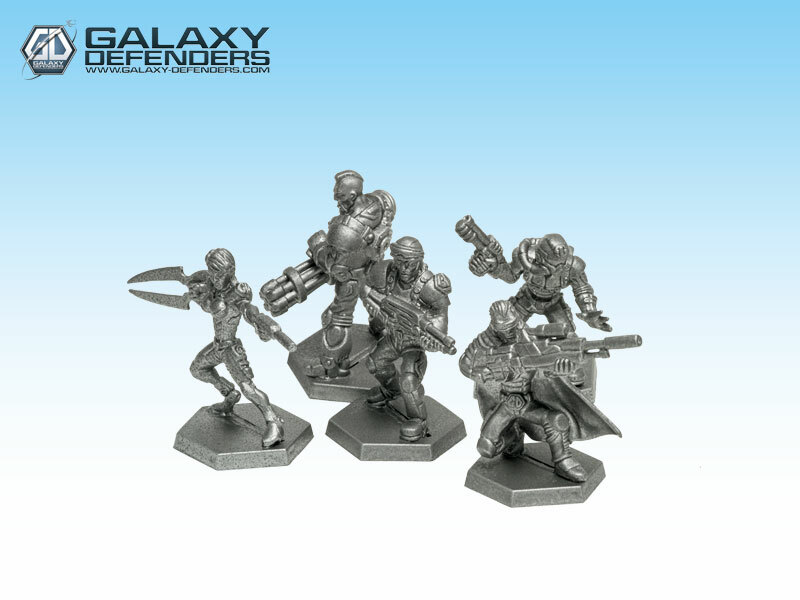 The agents will gain experience during the missions and this experience can be used to transform a good soldier into a perfect galaxy defenders agent with multiple skills, basic and improved tactics and the ability to use new devices, advanced human weapons and alien technology. 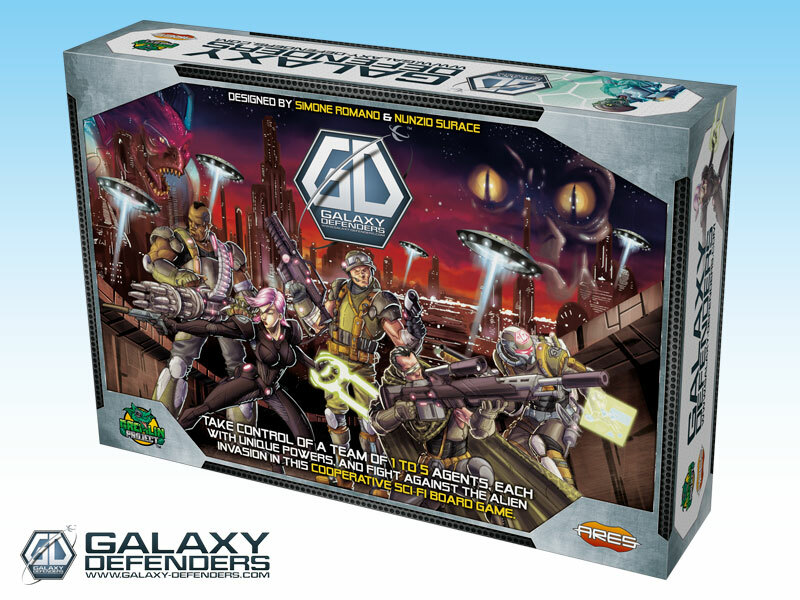 The core game features 28 high-detailed miniatures, modular maps, custom dices, agent profile sheets, event, alien and closed-encounter cards and much more. Alien Card: represent the A.I. of the alien, with his movements, skills, life points and weapons. Each alien figure on the map will be bonded to a specific card to keep track of his powers and life points. Close-encounter Card: is a card that will be drawn by the active player at the beginning of each aliens turn to determine which aliens must be activated. This system grants a different A.I. for each alien species, and also simulate the chaos of battle because the agents don’t know in advance which alien will be activated during the next aliens turn. The level of difficulty will scale dynamically based on the number of operative players in game. This system grants the right level of difficulty with any number of players. In this way, a player who wants to play alone is not forced to use more than one agent at the same time due to the lack of difficult balance. Even in case of death of some players, the game will set the difficult to a reasonable and enjoyable level.